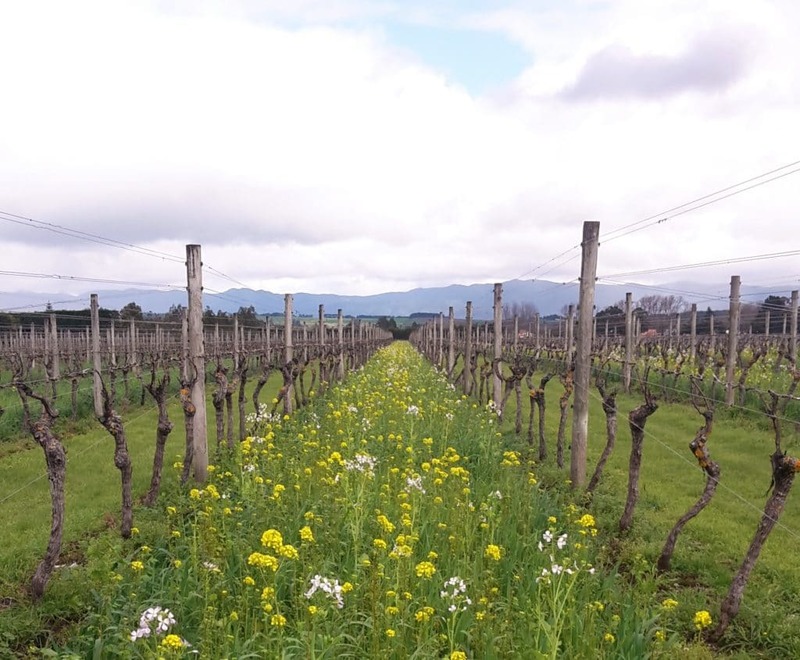 After an inspiring week in Wellington at the Pinot Noir NZ 2017 Conference, hearing individuals leading the industry in organic vineyard farming practices, I thought it was time to share our story. Dry River has been slowly shifting towards an organic regime for some time now. The canopy and disease management have always predominantly been organic, it has been the undervine weed competition and herbicide use that needed to be addressed. We’ve been ready for the change for a long time, and with the arrival of the under vine cultivator at the end of 2016 the reality of organic farming is starting to take shape. We have been able to cease using the herbicide’s and begin mechanical weed control. In a normal organic conversion, you would expect a lot more competition from weeds while they fight to get the weeds under control, but with our machine it does such a good job that that hasn’t yet been an issue. Wandering through the vineyard now, to a visitor that frequents Dry River the most visible change would be that no more are there neatly trimmed lawns between rows. You are now more likely to see shoots and leaves between the vines, with flowers reaching halfway up the trellis height. These are filled out with oats, clovers, mustards, rye grass, radish, a rejuvenation process for the soil, with each plant bringing a different property. Nick wasn’t at Dry River to view the 2017 season first hand, which I have heard coined the un-summer in this greater Wellington region. 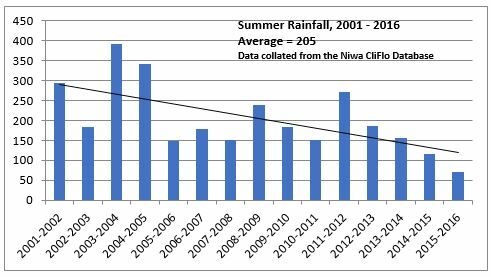 With 190mls of rain for the summer season by the end of January alone, this will definitely impact the graph above, and more importantly the soils below. But is this enough to provide any long-term results? We have explored the use of drought resistant root stock here at Dry River. The Dry River Pinot Noir block is a clone of rootstock called 5BB, and those are big strong vines, which might be quite drought tolerant. Otherwise we are limited to what root stocks are available to us. In answer to this we keep our focus on managing the pruning, how many buds we lay, which equals how much fruit we get and how much canopy growth. Those are the tools we have at our disposal, unless we want to install irrigation which for us is not an option. It is definitely a journey, one that we are committed to follow through. Not only does an organic vineyard make for a safer environment for the people that live and work here, it means we are producing wine free of agricultural chemicals, showing a true expression of the land in which it is grown. Great effort. Im very much in support of efforts to a) increase plant diversity and as a result increase overall animal diversity too and in the long run protect the soil from becoming lifeless. I think you will have great support. I look at a field of sweetcorn (roundup resistant) and there is absolutely NOTHING growing in that field except the sweetcorn. no plants no animals no insects. PS incidentally we need rules to limit the planting of only one species of tree in forests. Out radiata forests are silent sterile deserts. The french have realised that for centuries. Dear Thorsten, Thank you for your comments. We are very happy with this new journey in order to improve soil health. I am not convinced about anything resistance, evolution seems to disprove that approach. Unfortunately we are not yet using animals in our vineyards, I agree, it would be a nice introduction. I agree on your comment, whether it is vines, grass or forest, mono-culture leads problems in the long term. It is forbidden in many places in Europe to have a one species forest.